Mobile payment is now available at all metro stations in Hangzhou, eastern China’s Zhejiang Province, making Hangzhou the first city in China to realize full coverage of mobile payment in the public traffic system, China News reported on Dec. 27. Users of Alipay, a mobile payment app, will get a QR code on their smartphones, which they can use to enter the ticket gates at all 72 subway stations of the city’s three metro lines. Mobile payment, launched on Wednesday, makes use of cloud technology and big data technology. It relieves passengers from the burden of buying tickets in advance, thus shortening wait times for ticket purchases. A passenger is using a QR code to go through the ticket gate at a subway station in Hangzhou, Dec. 27. 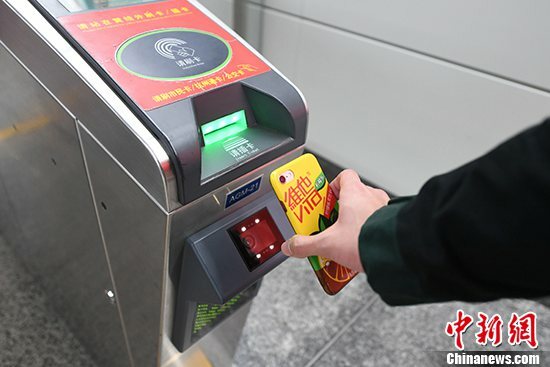 There are two mobile-ready ticket gate machines for entry and two for exit at each station during the trial period, said Wu Ting, spokesperson with Hangzhou Metro Group, adding that the service will be expanded to all ticket gate machines at metro stations in Hangzhou by the end of March 2018.